May 31st 1998 is to be a red letter day in the history of the Society and the name of George Formby. 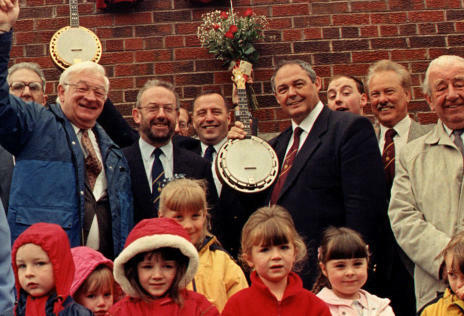 On that day, there is to be a unveiling of a plaque in the town of Wigan when finally the councilors of Wigan (George Formby's hometown) will recognize one of Wigan's most famous son's. The event is taking place only after many years of campaigning by long time Society member, Gerry Mawdsley who has worked tirelessly to gain the recognition that George Formby obviously deserves. 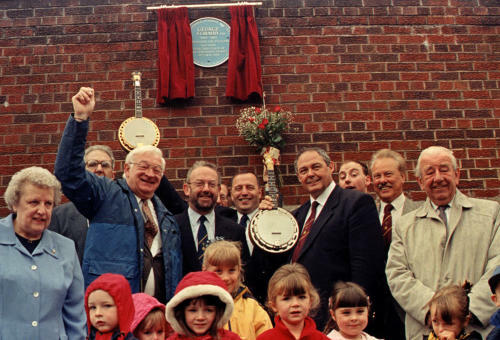 The plaque commemorating George Formby and his birthplace will be unveiled by Ted Formby, George's youngest brother, and the Mayor of Wigan, Councilor S. Little on Sunday 31st May at 12 noon. The plaque will be sited on the retaining wall adjacent to the pavement of the new road named Central Park Way and the Douglas Valley Nursery - opposite Central Park Rugby Ground. It is almost exactly the spot which was occupied by 3, Westminster Street where George Formby was born. After the unveiling, we shall all retire to the Grand Hotel for a celebratory concert of Formby songs performed by members of the Society. A good time is guaranteed! This event took place some years ago and remains here for archive purposes. GFS members included Peter Pollard, Gerry Mawdsley, Dennis Taylor, Anthony Mason and Dennis Lee. Red letter day for Wigan and Formby!